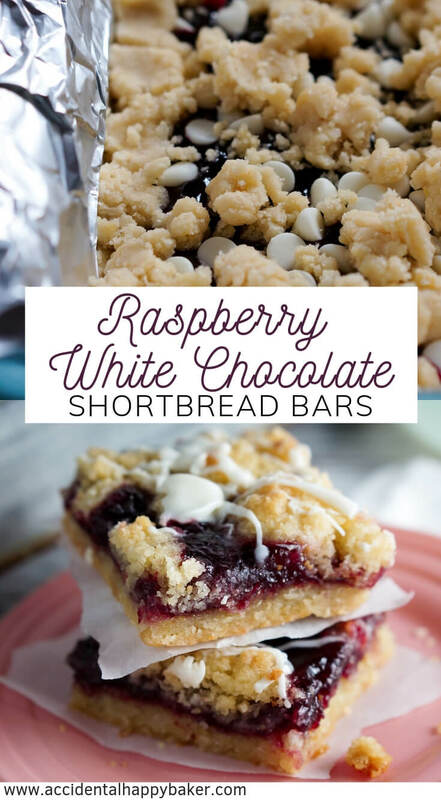 Raspberry white chocolate shortbread bars have buttery sweet and crisp shortbread cookie dough sandwiching raspberry jam and white chocolate chips for an easy cookie bar recipe that tastes and looks decadent! Let’s talk real, I love baking and cooking, obviously, but I’m not ever going to like doing the dishes. That’s why I dig recipes that use parchment paper and aluminum foil. You bake it and then the dish is still clean afterwards! I wish that technique could be applied to other areas of my life, it would make things so much simpler. 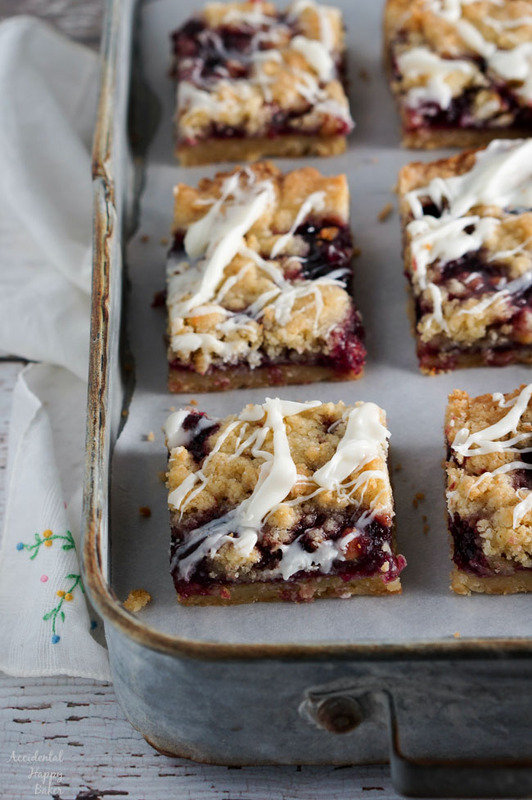 How do you make raspberry white chocolate shortbread bars? 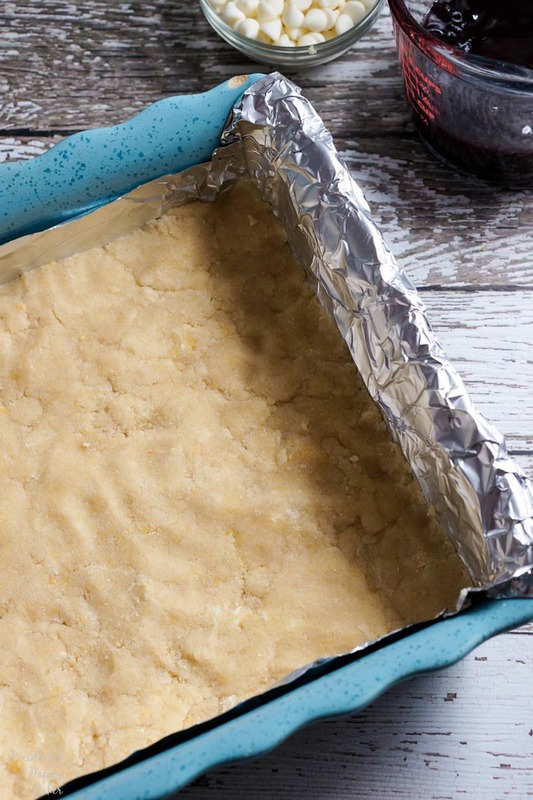 First you line a 9×9 pan with good nonstick aluminum foil, or regular foil that’s been buttered. Then mix together the flour, sugar, and salt. Next add the softened butter, almond extract, and egg. You can cut the butter into the flour mixture with a pastry blender or use your hands. (Even less washing that way!) 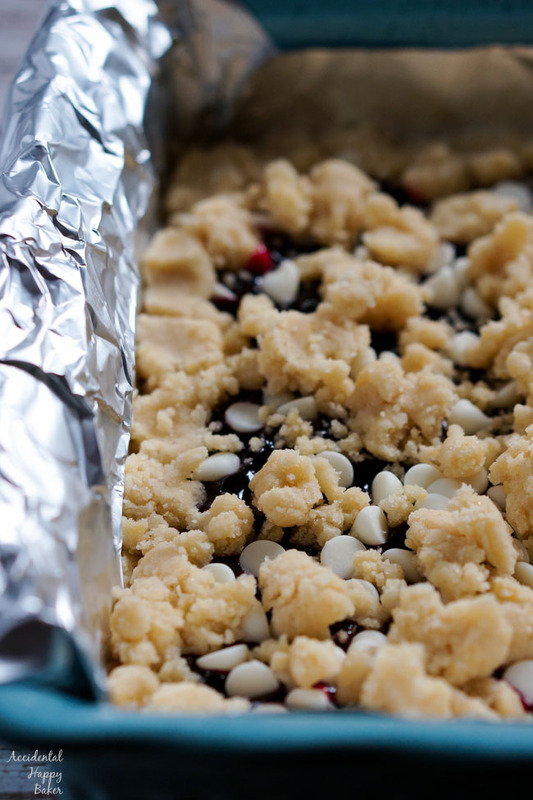 Mix it until it’s nice and crumbly. Press about half the dough into the bottom of your pan. Spoon ¾ cup seedless red raspberry jam over the shortbread, but keep about a centimeter border from the edge. 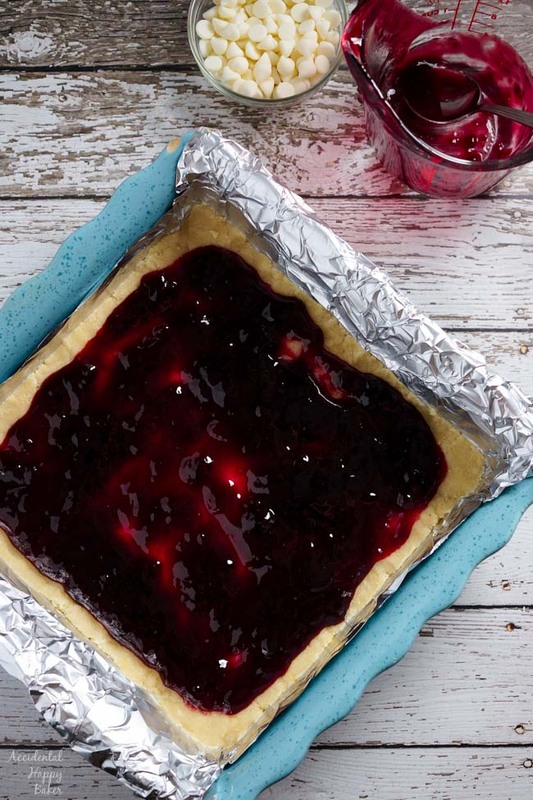 You don’t want your jam to stick to the foil. If you don’t want a white chocolate drizzle, then sprinkle ½ cup of white chocolate chips over the jam. If you do want to drizzle the tops, then just use about half the chips and reserve the rest for drizzling later. Lastly crumble the remaining shortbread dough over the top and bake! 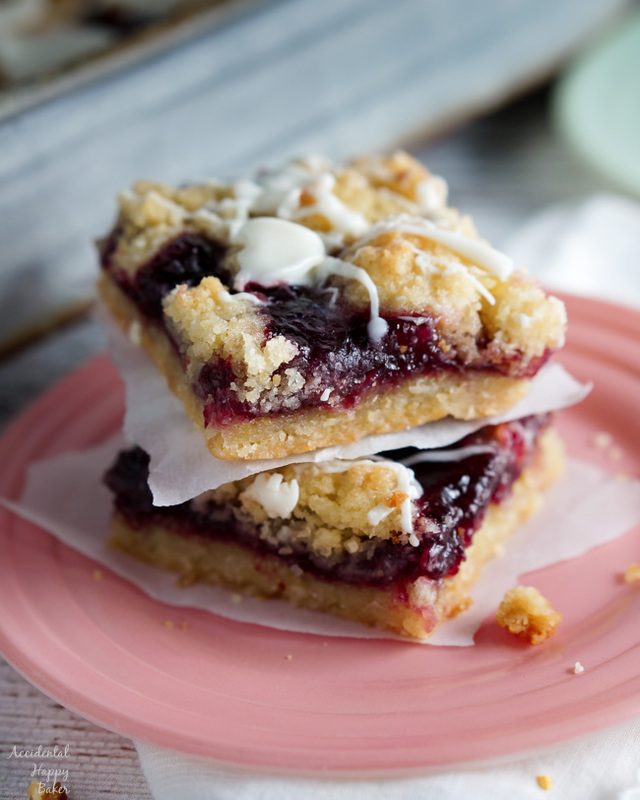 These jam bars pack so much flavor into a small package. They are sweet, but tart. The above links are affiliate links. Any purchases made through these link help support AHB at no additional cost to you. We appreciate your support. So divinely easy. You’re gonna love them. If you make these be sure and leave a review, a comment or tag me on your social media. 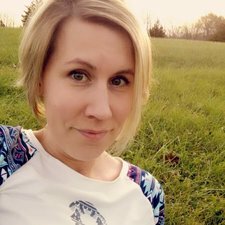 I’d love to hear what you think and see what you’ve been making! 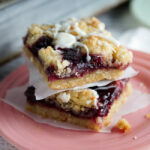 Raspberry white chocolate shortbread bars have buttery sweet and crisp shortbread cookie dough sandwiching raspberry jam and white chocolate chips for an easy cookie bar recipe. Preheat the oven to 350 degrees. Line a 9 x 9 square baking dish with nonstick aluminum foil. If using regular aluminum foil, butter the inside of the foil. In a medium mixing bowl, add the flour, sugar and salt. Stir lightly to combine. Add the softened butter, egg, and almond extract. Combine by cutting in the ingredients with a pastry blender, fork, or your hands. Mix until crumbly. Divide the dough in half. Press half of the dough evenly into the bottom of the pan. Next, spread the raspberry jam evenly over the shortbread, keeping a little less than a centimeter border around the edge. Sprinkle the white chocolate chips over the jam. (If you'd like to have a white chocolate drizzle over the tops, only use half the chips for this step.) Then crumble the remaining shortbread over the top. Bake at 350 for 35-40 minutes or until golden brown. Remove to a wire rack to cool completely before cutting. Optional drizzle. If you wanted the white chocolate drizzle over the tops of the bars, heat the remaining 1/4 cup white chocolate chips in the microwave at 50% power until melted. Drizzle the melted white chocolate over the tops and allow to sit until firm. 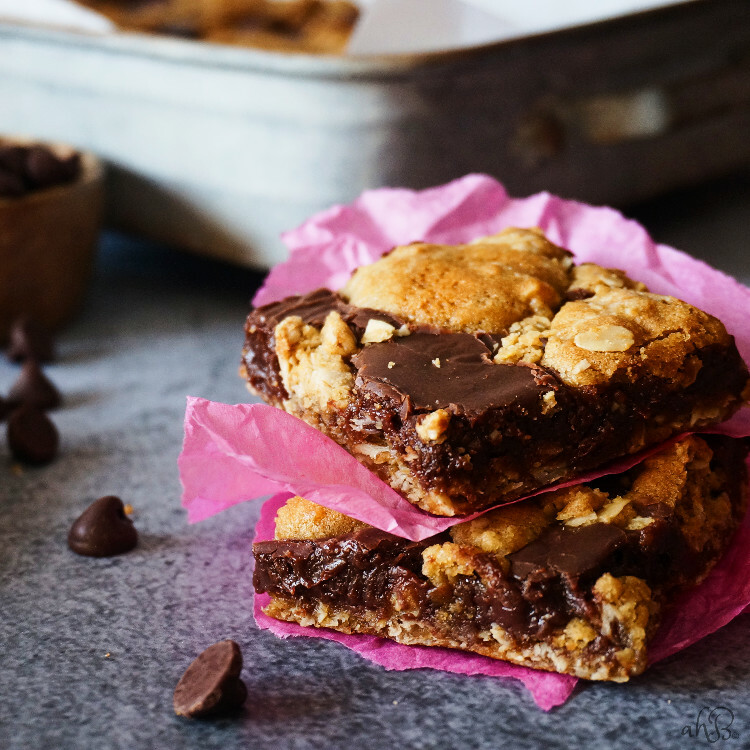 You might also like these Chocolate Rebel Bars.